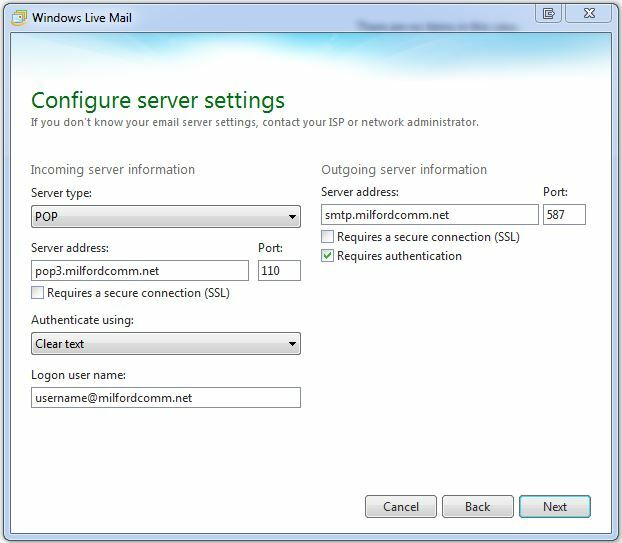 Q: How do I set up my Milford Communications email on Windows Live Mail? 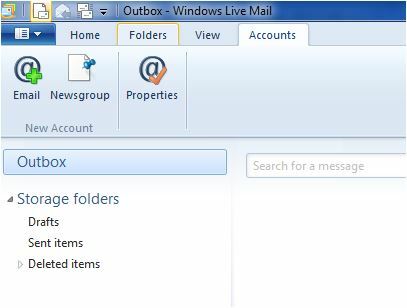 Windows Live Mail is actually a part of Windows Live Essentials (http://windows.microsoft.com/en-us/windows-live/essentials ). Windows Live Essentials includes other program such as Photo Gallery, Writer, Microsoft SkyDrive, Messenger, Family Safety, and Movie Maker. You can either install all of these programs or choose the programs you want to install during the install process. In most cases you will have to download and then install Windows Live Mail.Â It does not come pre-installed on the computer. 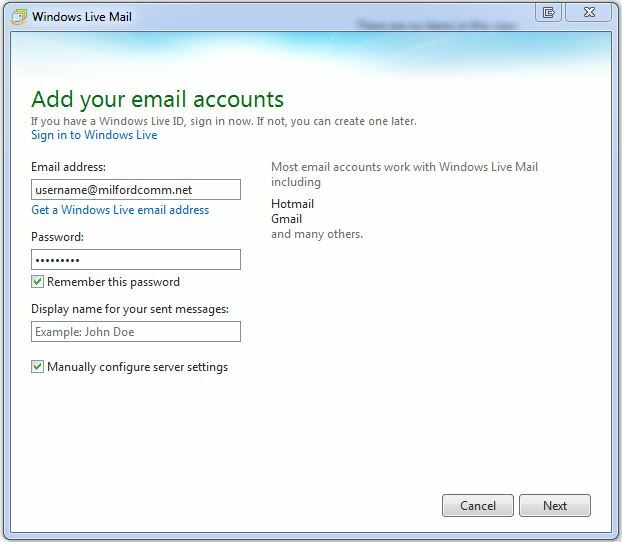 Here are the steps for setting up your email account with Windows Live Mail. 2. Fill in the Email address, Password, click Remember this password (optional), and check Manually configure server settings. Note: you can substitute milfordcable.net or milfordcable.com for milfordcomm.net. Then click the Next Button. 3. In the Configure Server Settings box enter the correct incoming and outgoing server information. You will need to put the full email address in for the logon username, change the outgoing mail server Port from 25 to 587, and check the “Requires authentication” check box. Click Next and then Finish on the final window to complete the account setup. 4. Once completed you will need to change one final property. To keep your mailbox from reaching its storage quota, you need to change the setting to remove email from the server. To do this click the Properties button under the Accounts tab. Then when the Milfordcomm (username) Properties box pops up choose the Advanced tab. At the bottom check the Remove from server after 5 day(s) box so that your email does not build up indefinitely on Milford Communications email server. You can adjust the number of days to leave a copy of messages on the server to meet your needs or even uncheck the box to leave a copy of messages on the server. 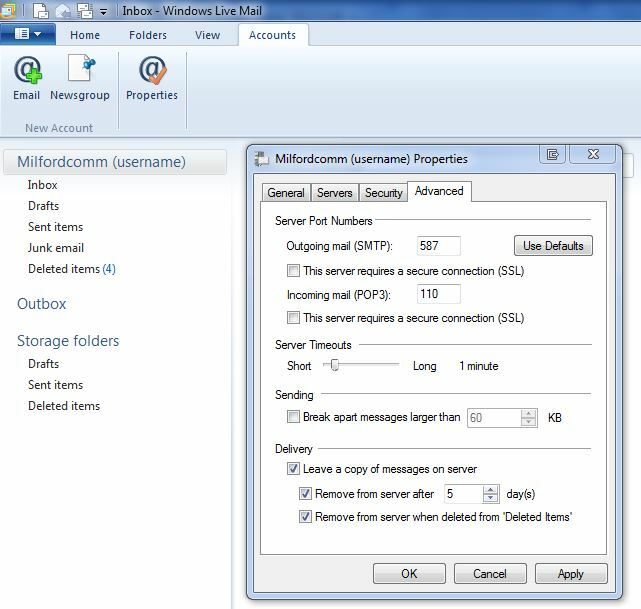 If this box is unchecked it will download messages to Windows Live Mail and remove the them from Milford Communications server immediately. To check which messages are on Milford Communications email server you can check the webmail using a web browser at https://webmail.milfordcomm.net/surgeweb/ .